We flew Delta from Cincinnati to San Juan with a two hour layover in Atlanta, giving us a brief chance to enjoy the benefits of Sky Club membership - satellite TV, concierge service, and a fully stocked bar. I am only allowed two complimentary guests, but a day-pass for $25 is a heck of a deal - couches, snacks, nicer restrooms, peace and quiet. If you've never been to a Crown Room or Sky Club, I encourage you to treat yourself to a day pass the next time you have a long layover. You might even see a celebrity like Cyndi Lauper! Seriously, we were just relaxing and minding our own business when this entourage comes in and sits down right behind us. Martha finally said to Heather, "that looks like Cyndi Lauper!" Heather said, "That's because it IS Cyndi Lauper!" :-) This was confirmed by the word "CYNDI" scrawled on one of her shopping bags. That may be the biggest star run-in I've ever had. Unfortunately Martha wanted to play it cool so the only photo we got was a crappy one I snuck on my iPhone. "This pristine ecosystem teems with astonishing marine life, inhabiting a secluded lagoon protected by mangrove forests. 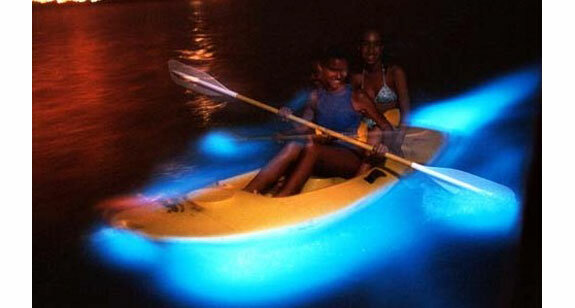 The water comes alive with millions of glowing organisms that must be seen to be believed! These microorganisms are known as plankton (that live suspended in the seas between the surface and bottom, at the mercy of the wind and the current). There are only four bioluminescent bays and one lagoon in existence on Earth! Very few people, even Puerto Ricans, are aware of our little known, bioluminescent lagoon. Pure Adventure provides a unique opportunity to visit and actually kayak in the "Bio-Lagoon" known as "Laguna Grande". This lagoon is the best place to appreciate this phenomenon, being a closed environment, allowing the microorganisms to flourish in bigger concentrations!" What a bargain this was at $65 per person, including transportation. The kayaks were outfitted with blinking lights on the front and back. This didn't seem necessary in the open water, but when we paddled into the mangroves, they were sometimes all you could see in front of and behind you. It was very peaceful. After about 20 minutes of paddling, we came again to open water - a big lake where we were led to a dock where we huddled together in our kayaks for further information about our location and the intriguing wildlife we were about to witness. Finally, we paddled out near the middle of the lake where our paddle strokes began to glow a flourescent blue. The guides came around with little tarps for a couple people to huddle under at a time so you could see the glowing even better. I bet this trip would be AMAZING under a new moon when the night is black. The only thing I would do differently would be to stash our nice DSLR camera onboard in a water-tight bag. The waterproof point and shoot camera we brought along didn't capture any of the glow and the water was plenty still to take pictures with a DLSR with minimal risk. Anyway, it was really cool and well worth the trip. We returned around 10 or 10:30pm to the park in Fajardo that served as our launch point and were treated to a snack by Pure Adventure. After changing clothes (in the nasty park restrooms), the chauffeur took us back to our hotels. Tip - take water shoes, swim suits, and a change of clothing for after the adventure. We didn't get too wet, but it was nice to ride home in dry clothing. On Friday morning, we again decided NOT to hike in El Yunque (see our 2008 album for more on El Yunque). We just slept in a little, repacked our bags, and caught a taxi to the port to board early. This paid off big time as we were among the first in line and got upgraded from our oceanview staterooms to balcony staterooms!!! Yay times ten! The rooms weren't adjoining, but they were next door and we were able to lean over the railing and chat. We were also able to hand the chairs over from one balcony to the other where there was plenty of room to seat 4 people. We spent a few evenings on our balcony with Heather and Emil enjoying our own happy hour before dinner. After settling in, I headed up to the Mast Bar to meet some fellow cruisers I had been corresponding with on Cruise Critic. This was the most active CruiseCritic Roll Call I had ever seen - about 80 of us all chatting before the cruise. At the bar, I connected with a number of people that we would later team up with for excursions, including Neil & Jerry. Around 5pm, we all headed back to our rooms to prepare for the Muster Drill. Afterward, Heather, Emil, Martha and I dressed for dinner. Since we opted for the late (8:30pm) seating, we first stopped by the Art Gallery for the Champagne Reception. The host was about our age and very pleasant. Somehow we got to talking about wine and she recommended visiting the Okanagan Valley in British Columbia if we ever got the chance. She described it as Canada's Wine Country (Vernon, Kelowna, and Pentictan). Maybe someday. Anyway, we found some free alcohol AFTER dinner too - a liquor tasting at Emporium Gifts on deck 5. Not that I needed any help sleeping that night.